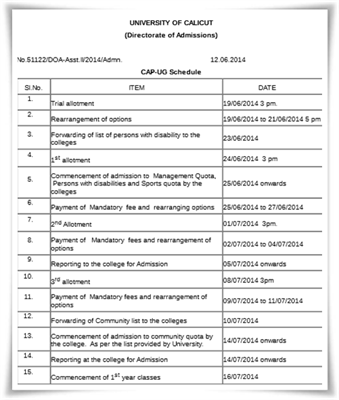 Calicut University has published the CAP allotment schedule of degree 2014 admission for various courses in the colleges. As per the schedule, the provisional rank list & trial allotment would be published on 19th June 2014 at 3 PM at official website www.cuonline.ac.in/. Those students who have applied for the courses can check their trial allotment status by logging in the official CAP(Centralized Allotments Process) portal of the University. Students will be given sufficient time to modify and rearrange options. The first allotment for the degree courses will be announced on 24th June. The allotment timetable will help the students and parents to know the important dates regarding the Centralized Admissions Process(CAP). After the first schedule allotments, a supplementary list consisting of twice the number of candidates ranked in order for admission will be published. The schedule of the 4th and 5th allotment following a notification would be declared later. The sport admission for SC/ST candidates will be done at the office of Directorate of Admission, University of Calicut at a convenient date. Those students who get admission should have to report at the concerned college on 14th July 2014. The first year degree classes will commence on 16th July. whether the first trial allotment for degree is published. Can i change my degree options on 23rd june? I'm in a bad situation...eventhough the university published the trial allowtment everybody could see it today...what shall i do? Plz help me! Can i change my options on 23rd or 22nd june? Plz help me..
Vishnu, you can see your degree allotment here.